Every year, the fifth graders read The Lemonade Wars by Jacqueline Davies for summer homework. In this story, the two main characters decide to set up lemonade stands to see who can earn the most money in a week-long period. The characters end up donating the money to a charity close to their heart. As an extension to the story, our 5th graders set up and run their own bake sales. All the money we earn goes to a charity close to our heart- Kenya Connect. 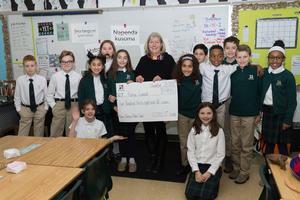 Fifth graders held a month-long bake sale fundraiser. They divided into small groups of 3-4 students to oversee each week of the fundraiser. Each week had a different theme: week 1: Soccer, week 2: Emoji, week 3: New York City, week 4: Halloween. Students promoted their fundraiser on the school social media and newsletter, during their lunch and during student drop off. By selling their homemade treats for 50 cents, our students successful raised$485.45. This project taught students team-work, compassion, goal setting, responsibility, independence, and money management.